Next Article What kind of week has it been? This is a friend of mine that you are talking about. I met her in an online support group for grieving parents. I just want to say that your support for her is immeasurable. As parents who have lost children we live everyday knowing that we will never see our children grow and do the things they should have done. I can tell you, if it were a story about me, I would be so touched. I already am. I am sure she is also. Again thank you!!! Thank you for reading and replying my post. When I wrote this post it wasn’t intended to reach the family that I was observing/writing about, but I’m glad now that it did. 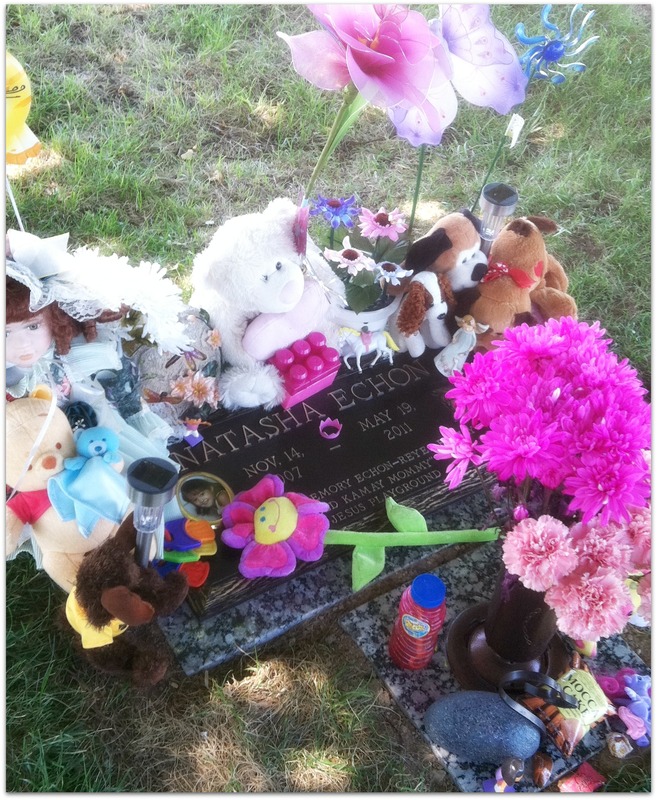 I still drive by Natasha’s grave and think of her every day. I lost my 22 year old son in June of 2010. He left behind a 3 year old daughter who now asks Santa for something nice to put on her daddy’s grave, who goes around to all the other graves saying a prayer for them and picking wild flowers to put on her daddy’s grave. She will see one which is a child and she will put a flower on their grave also. Sadly she knows to much about death but it has taught her great compassion. Take your son to pick out some special angel or butterfly and together put it on her grave. It is something he will always remember and help him understand that compassion goes beyond life. There is also a book called Heaven is Real and there is a child’s version of it. It is beautifully done and a real story of a young boy who died and was brought back. He discribed Heaven and what he had seen there. It is always better to teach the children about death before they have someone close to them die for it isn’t so scary then. Prayers go out to you and your son and to the family of Natshia. Thank you, Shari, for reading and replying with such thoughtfulness. I still think of Natasha every day when I drive past the cemetery.